For some students, the idea of starting a career after college can bring up feelings of anxiety. But Sonoma State University has several ways to prepare students for the transition from education to career starting as early as freshman year. 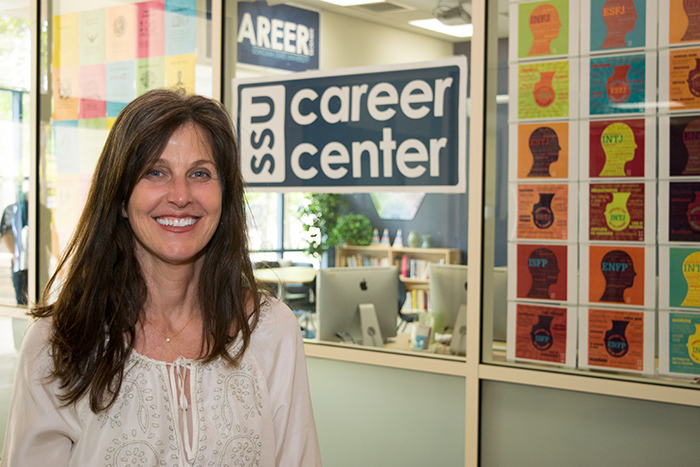 For starters, Sonoma State's Career Services department leads the way by offering career counseling, one-on-one advising sessions, mock interviews and much more. "Students can come here with an idea and a set goal of what they want to do, but they might not have any idea of how to get there," says Career Advisor Ann Mansfield. "We help give students direction with drop in counseling and special skill building workshops, and we are here to give them that feedback they might need." Mansfield has also focused on expanding the career fair since starting at Sonoma State. "When I first started in 2013, the career fair had 60 employers," she says. "Last year we brought in 122 employers, and they were selected according to the specific careers that students want to be a part of." Following in the footsteps of successful programs at other campuses like Humboldt State and Fresno State, this year Career Services added the "Seawolf Closet" to their offices on the first floor of Salazar Hall. Students can pick up professional interview clothes donated by fellow students, staff, faculty and the local business community. "Sometimes students can't afford the clothes that they might need for a potential interview," says Mansfield. "We like to give them a hand and let them be fully comfortable for the interview so that their mind isn't worrying if they don't look dressed for the part already." The School of Education also holds a career fair for educators each spring to make the connection between prospective teachers and school districts from all around Northern California. This year more than 90 employers participated in the annual educator job fair, with more than 300 job seekers attending. "These employers come from all around California to meet with our students because they love our strong positive reputation of highly qualified education candidates," says Carlos Ayala, dean of the School of Education. "Most the employers that participated this year have attended at least twice in the past, and we get new school districts participating every year." In the School of Arts and Humanities, the Student Service Center helps students plan for a career that involves their specific field of study. With an internship consultant on staff brainstorming with students about possible internship placements or assistance with job searches specific to their major, the Center is the a good first stop for Arts and Humanities students searching for meaningful career options. The School of Business and Economics Career Center has been a robust part of the school for more than 20 years, connecting students to approximately 300 internships and nearly 100 professional mentorships each year. How do they do this? "Nurturing," says Susan Adams, interim director of the School of Business and Economics Career Center. "My goal is to have students really understand the importance of self-reflection, knowing what they are good at, what they are passionate about, and taking the really critical time throughout their career to really understand what motivates them, identify their strengths and then find a job that fits that or matches that," says Adams. The school's Accounting Forum student club, led by Economics Professor Joe Standridge, also places about 100 students in jobs each year, and has such a good reputation that Sonoma State students are now heavily recruited by the "big four" accounting firms of Deloitte, Ernst and Young, PWC and KPMG. Student clubs exist in all schools, and can be a powerful networking tool for finding internships and making connections for jobs after college. In the School of Science and Technology, the Biology Club, Chemistry Club, Computer Science Club, Geology Club, Math and Stats Club, Nursing Club, Engineering Club, Health Professionals Club, and many others hold their own job readiness workshops specifically geared toward students in those majors. Sonoma State University offers students all types of career development options for specific career paths. Whether a student choses to join an academic club, schedule a mock interview for an internship or attend a career workshop at career services, students will have a leg up in the competitive job market. "We are here to serve all majors so I encourage every student to come in and check out your resources at career services," says Mansfield. "Drop-ins are always welcome."